I figured that quitting my job to travel the world was a thing to be celebrated so I gathered up some friends and headed to Meiringen, a lovely town in the center of Switzerland. It is a great place for adventures and, if you ever have a chance to visit, here are some things that I recommend you do. 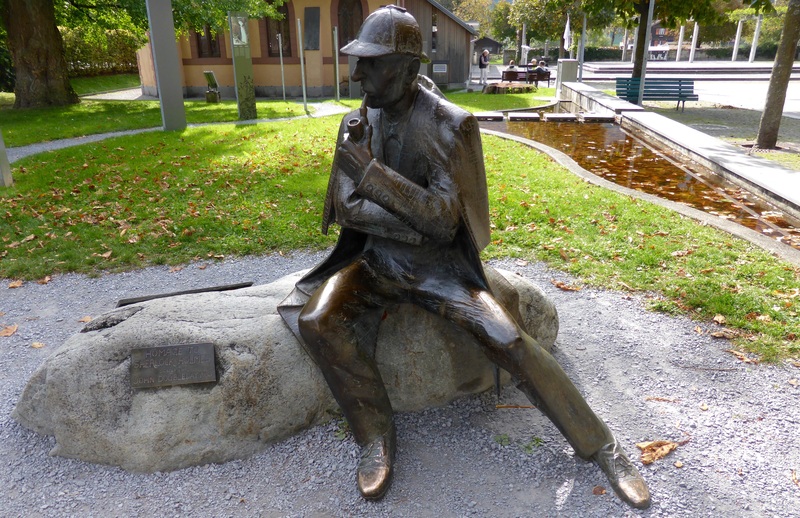 Visit the statue of Sherlock Holmes and ensure that people look at you as if you are crazy by examining every inch of it to find the clues to his books. Visit the Sherlock Holmes museum – coolest audioguide in the world ever! Take the funicular to Reichenbach Falls. Wear sensible shoes and be prepared to climb a lot of steps to the top of the falls. Do not tussle with Dr. Moriarty and possibly plummet to your death. Visit the Rosenlaui Glacier Gorge (more steps). We traveled everywhere by public transport (because, in Switzerland, why would you do anything else? ), stayed at the Hotel Victoria and bought meringues at Frutal. First item checked off my Things To Do list. Yay! This is beautiful! Thanks for setting it up. I’m looking forward to keeping close through your journey with this!